Would There Be Outrage If A Republican Ran An Ad Targeting A Democrat Like This? 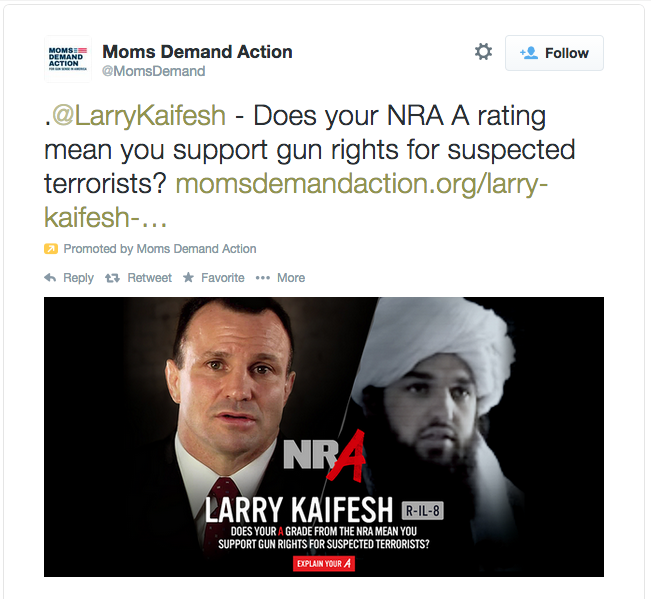 Over on Twitter, Congressional candidate Larry Kaifesh is getting hit with an ad that puts his photo right next to a 'terrorist' and calls into question his record on guns. Could a Republican or Republican IE group get away with this type of connection drawing? Would there be outrage saying that this is a bit too far to go in politics??? Listen...we don't think guns are a very good issue for us as a party. We *get* that hunters and folks downstate and elsewhere want to have guns and that they lean on the '2nd Amendment'. That's all fine and good. But...when it comes to the suburbs, guns aren't going to win many votes - especially automatic weapons and such. We can be 'for' recreational hunters and their weapons - and be true to the 2nd Amendment - but still come out and talk about limits on how many weapons, the type of weapons, and how long it takes to get one. Putting in safeguards and not giving someone who lives in the suburbs a weapon that can take down hundreds of people in seconds just makes sense. But, that's not the point here. We really wonder: would there be outrage if someone put a photo of Tammy Duckworth or Shelia Simon in a photo with a terrorist?